Drumboe was cold but the welcome was warm. 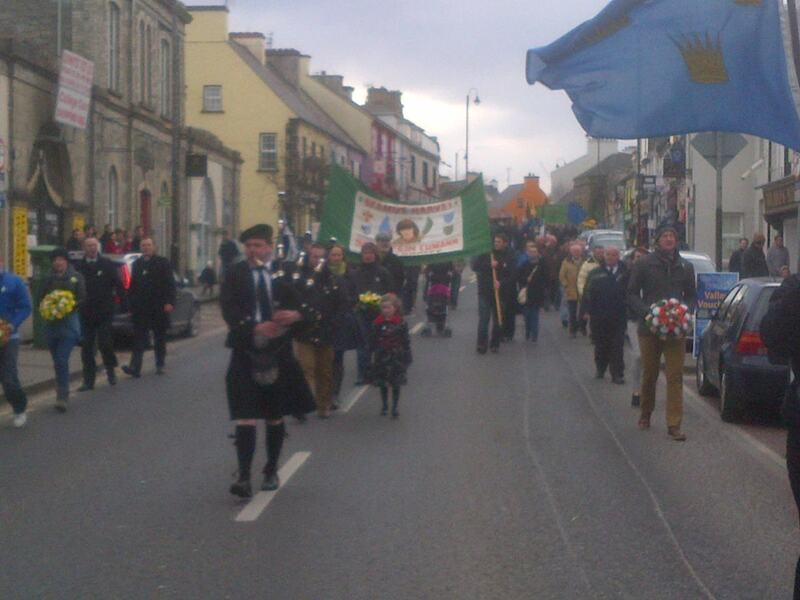 This year the powers that be had decided I would be the main speaker at the Drumboe commemoration in County Donegal. People were glad to see me and I them. The surrounding mountain peaks had coverings of snow but unlike Belfast there was none on the roads or footpaths. But it was bitterly cold. It had a sharpness that cut to the bone and left ears numb. The Drumboe commemoration is held each Easter at the republican memorial to the IRA volunteers of County Donegal who from every generation have fallen in pursuit of freedom and sovereignty. The Celtic Cross and the small plot that holds it, can be found at the end of the main street of Stranorlar, just before you cross the arched bridge that brings the traveller from the north side of the River Finn, to Ballybofey on the south side. Stranorlar was among the first garrison towns in Ulster in the 16th century built after the plantation. Even today there are no schools or churches in Ballybofey - they are all in Stranorlar – a hangover from those days and the penal laws. The proximity of the twin towns to west Tyrone and the closeness of the communities that live on either side of the border also means that all of those republicans on the rolls of honour and remembrance for Donegal and west Tyrone are remembered each year at the Drumboe Easter Commemoration. This year holds a particular significance because it marks the 90th anniversary of the four Drumboe martyrs - four IRA fighters, Charlie Daly, Sean Larkin, Daniel Enwright, and Timothy O' Sullivan who were captured and held in the nearby Drumboe castle from January 1923 until they were executed by Free State forces on March 14th 1923. The Tan War against British forces was deadly and vicious, but the civil war left a bitterness and a political legacy that still shapes politics in the Irish state to this day. The civil war turned brother against brother, and neighbour against neighbour. The four who were shot by firing squad at Drumboe were among 77 republicans executed during those terrible years by the Free State. There was never any process of truth recovery or reconciliation put in place after those catastrophic events. We should learn from that mistake. During the recent conflict others died in the south as a consequence of the conflict. Tom Smyth, a republican prisoner, was killed in Portlaoise prison and Hugh Hehir was shot dead in County Clare. During the era of the heavy gang many citizens were brutally assaulted. Beatings were also common place within the prison systems. And there was collusion between elements of the Irish Defence Forces and the British forces in the north. 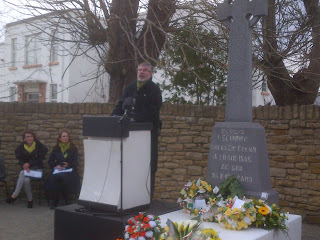 We remember the death of Donegal Councillor Eddie Fullerton and others. But it is important that Republicans also acknowledge that we too inflicted great hurt. Members of the defence forces, including An Garda Síochána were killed by republicans. These matters need to be faced up to. Sinn Féin believes that the best means of addressing these matters is through the establishment of an Independent International Truth Commission. The two governments’, former combatants and those in leadership across Ireland and Britain need to part of such a process. There can be no hierarchy of victims. The people of this island need a genuine process of national reconciliation. I am prepared to meet with victims’ families and others as part of this. There is a need for a healing process so that we can all go forward in a united and harmonious way looking after victims, and victim’s families and survivors is a significant and important part of this. The proclamation of 1916, which is the mission statement of Irish republicans, is explicit in its anti-sectarianism. This is important as republicans seek to address at what is the start of the north’s orange marching season, the controversy over flags and emblems. Unionist leaders have to face up to the reality that the old ways and the old days are gone. The vast majority of citizens want to live in a fair society based upon equality and Sinn Féin is committed to bring that this about. This means being prepared to enter into a rationale and informed debate with those who represent disadvantaged unionist communities about the difficulties they face every day and to vigorously challenge sectarianism and segregation and inequality. Irish republicans are absolutely committed to the principles of equality and parity of esteem, and mutual respect contained in the Proclamation and in the Good Friday Agreement. The tiny minorities on all sides who espouse violence must be rejected. They are stuck in the past while all around them Ireland north and south is changing. Their actions will not destroy the peace process, or the efforts to create a new republic, but they can destroy lives, including those held in the prisons. The British government also cannot evade its responsibility in this respect. The continued imprisonment of Marian Price and Martin Corey is unacceptable. They should be released.